TWENTIETH DAY. --LOVE OF THE BLESSED VIRGIN TOWARDS THE SOULS IN PURGATORY. Since our Divine Redeemer has given us Mary as a mother, when, dying upon the cross, He spoke to his disciple, "Behold thy mother," the Blessed Virgin regards us all as her beloved children, but she harbors most tender feelings of maternal love towards the suffering souls in Purgatory. Let us then afford the Mother of love with the satisfaction of giving abundant suffrages to the souls in Purgatory. Taking into consideration the great prerogatives of the Blessed Virgin, and the infinite love of the Holy Trinity towards her, we cannot doubt that by her merit and intercession every penitent suffering soul would be delivered, that Purgatory could be emptied at once, were such according to the inscrutable ways of God. But God has His own designs, founded on His infinite wisdom, justice, and mercy. The Blessed Virgin does not pray to have all suffering souls delivered at once, for her will is in perfect conformity to the Will of God, and she exercises her dominion over the souls in Purgatory in perfect union with this Divine Will. St. Bernardine of Siena applies to Mary the text of Holy Writ, "I have walked in the waves of the sea," (Eccl. xxiv. 8.) and adds, "She descends into the sea of fire, quenching the flames for the suffering souls." Denys the Carthusian attests that the souls in Purgatory experience the same joy and relief, at the mere mention of her name, that consoling words bring to the bedridden sick. 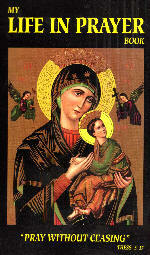 Prayer: O most holy and glorious Virgin Mary, Blessed Mother of our Lord! We place our petitions for the suffering souls into thy hands; cleanse them from all imperfections, and by thy intercession, obtain for them eternal rest. Through the same Jesus Christ, Thy Son, our Lord. Amen. Practice: Say the Litany of the Blessed Virgin for the suffering souls.